This blog needs some serious lovin' from me. I've been gone too long, but I'm here now. I came across this photo a few days back, and it immediately struck a cord. Such a simple thing, yet so effective. 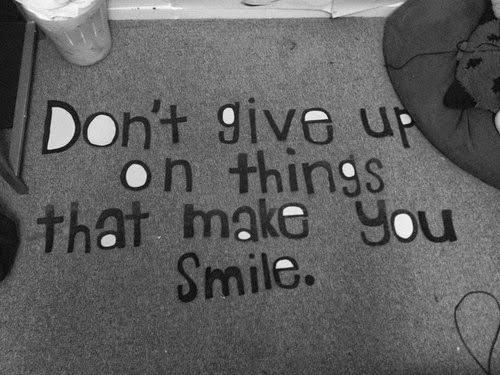 Don't give up on the things that make you smile. If you sit down and think about it, how many of us can actually do this? Have we been able to stay true to ourselves, in the face of rationality and ambition and the demands of society and everyday life? How simple and silly and predictable is the list. And yet, how easy it is to end up going for months without doing any of these things, and letting your life become drudgery. Today, I just want to tell you one simple thing - In the next 24 hours, do one thing that makes you smile, that makes you very happy, that you're crazy and passionate about. Pamper yourself, give yourself a treat, take a break. Make yourself happy. I know this is not my usual writing style. I don't do philosophy and self-help and spiritual liberation and positive attitude. I don't. But sometimes everybody needs to. Tell me about the things that make you smile. I'll be back in this space soon to rant and rave about my life, and to pound you with unforeseeable lectures and awful humour (It's so awful it becomes funny). Those your cartoons? Awesome talent. Welcome back to blogging. I feel like it is a dying art. No, no, not my cartoons at all! The source is linked below the comic. I like to share comics in each of my posts. And I am a compulsive blogger, but yes, it is pretty much a dying art! A LOT of American TV shows - The Mindy Project, New Girl, Scrubs, et al. Receiving a book from my Dad--- Gives me immense Joy!